Voorhees College is a four-year, private, coeducational liberal arts college affiliated with the Pro…. 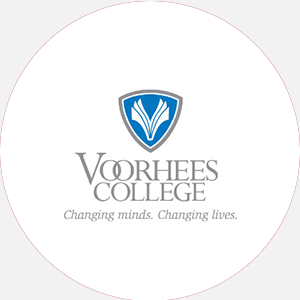 Voorhees College is a four-year, private, coeducational liberal arts college affiliated with the Protestant Episcopal Church. The school, originally known as Denmark Industrial School, was founded in 1897 by Elizabeth Evelyn Wright and began with 1 teacher and 14 students. In 1902, the name changed to Voorhees Industrial School. Between 1922 and 1929, when the school was experiencing financial difficulty, a singing group was developed that toured the country to raise money. In 1929, postsecondary education began and the name changed to Voorhees Normal and Industrial School. The name changed again in 1947, to Voorhees School and Junior College. When the school became a four-year college in 1962, it adopted its present name, Voorhees College. Voorhees strives to prepare each student for a well-rounded, fulfilling future by providing an environment that leads to academic achievement, spiritual enrichment, and social development. The liberal arts emphasis is designed to develop an appreciation and knowledge of the fundamental value of our society and a sense of the common bond that binds man to his fellow. The twenty three-building campus is situated on 350 acres, 100 of which are used for growing timber as a cash crop. Facilities are a blend of historic and modern, including the Booker T. Washington Hall and the Wrights/Potts Library. Visitors and students are especially impressed by the St. Philips Episcopal Chapel, which was built in 1935 entirely by Voorhees students. Voorhees College is accredited by the Southern Association of Colleges and Schools to award the Bachelor of Arts and Bachelor of Science degrees. Range of scholarships and grants: 0–80 Financial Aid Specific to the School Army ROTC, in cooperation with South Carolina State College, offers two- and four-year scholarships that pay tuition, fees, books, and a monthly stipend. Graduation from an accredited high school (or equivalent) and completion of the following units: 4 English, 3 mathematics, 2 science, 1 history; 1 economics/government; 1 social studies; 1 physical education; 9 other academic units must be earned in foreign language, literature, social studies or science. Students must have at least a 2.0 GPA and rank at least in the middle third of their graduating class. Students should submit two recommendations by their counselor or principal and instructor and a medical form completed by a physician. A nonrefundable application fee is required. Admission Application Deadline: April 30 (priority); rolling admissions. A minimum of 122 to 135 credit hours and completion of core requirements to include the following hours: 12 English, 6 mathematics, 6 natural science, 12 social science, 3 computer science, and 12 foreign language (for BA degree). Students must pass the English Proficiency Examination, maintain a minimum 2.0 GPA. The last 30 hours must be completed in residence. All students must participate in commencement exercises. STUDENT LIFE Campus Regulations: Curfew, quiet hours, dorm visitation hours, and required class attendance. Campus Services: Health center, personal counseling, psychological counseling referrals to Brooker Mental Health CeCampus Regulations: Curfew, quiet hours, dorm visitation hours, and required class attendance. Campus Services: Health center, personal counseling, psychological counseling referrals to Brooker Mental Health Center, career planning and placement, student employment services, tutoring, chapel and religious activities. Campus Activities: Social and cultural activities include theater, chorale, lyceum, and religious activities. Students may get involved in the Voorhees Vista (student-run newspaper), the Tiger (yearbook) or the Southern Voice (magazine). The concert choir presents annual Christmas and spring concerts. Black History Month ../includes a keynote speaker and a panel discussion focusing on past accomplishments of blacks in America and setting goals for future progress. The Family Life Institute is sponsored annually and focuses attention on the social and psychological problems of the black family. Leadership opportunities can be found in the Student Government Association (SGA) or the numerous other clubs and organizations, which include the NAACP, the GEM literary club, and premedical and predental clubs. Greek sororities include Alpha Kappa Alpha, Delta Sigma Theta, Phi Beta Sigma, and Zeta Phi Beta, as well as the Vogue sorority; fraternities include Alpha Phi Alpha, Kappa Alpha Psi, Omega Psi Phi, and Phi Beta Sigma. Honor societies include Alpha Kappa Mu and Alpha Chi. Housing Availability: There are 508 housing spaces. Freshman housing is guaranteed.